Light moves fast. That's kind of the whole point of light, at least the way most people think about it. Light shoots through the 93 million miles between Earth and the sun in just 8 minutes, it carries information all around the world nearly instantly, and its top speed of 186,000 miles per second (300,000 kilometers/s) turns out to be the absolute speed limit of the entire universe. 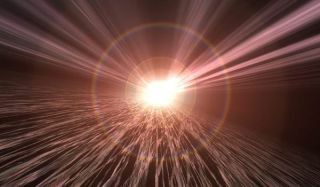 But there are some physicists interested in turning that trait of light on its head, and slowing it way down. And in a new paper, published Jan. 3 in the journal Physical Review Letters and on arXiv, a team of researchers showed that light could be made to come to an absolute stop at certain "exceptional points." But the technique described in this Jan. 3 paper doesn't rely on supercooled atoms or imprinting light. Instead, it relies on some funny quirks of how waves — including light waves — behave under the unusual circumstances of "exceptional points." An exceptional point is a place where two complex wavelength patterns that mirror one another meet — merging into one pattern or the other, depending on which way they are traveling. But the reality is, waves in the real world — whether they're made of light, sound or quantum vibrations — are much richer and more complex three-dimensional shapes that change constantly, according to the properties of the container they're moving through. By tuning the properties of the container just so, scientists have figured out how to collapse one complex wave into its mirror twin. This phenomenon happens at exceptional points, or points around which waves show exceptionally quirky behaviors. Fire a beam of light and its mirror twin through the point one way, and both will emerge looking like the original beam of light. Fire them through the other way, and both will emerge looking like the mirror wave. In this paper, the scientists showed that, theoretically, the properties of the exceptional point and the beams of light could be tuned in such a way that the light would stop moving entirely at this exceptional point. Change the properties and light beams again, and the light would continue on its merry way. For a long time, scientists thought exceptional points were purely theoretical concepts. But back in 2010, researchers were able to build one in the real world by firing microwaves through a specially built metal box, causing the wave patterns to flip from one mode to another. Researchers haven't yet built a light-stopping exceptional point in the real world — and it remains to be seen whether anyone will. In a statement from the team behind the light-stopping exceptional points paper, the researchers said that their next step is to figure out whether similar exceptional points could stop other kinds of waves, like sound, in their tracks. Down the road, the team wrote in this paper, they expect the up-tick in research into exceptional points to help solve important problems in quantum mechanics, and point the way toward new technologies that rely on bending and shaping waves.